Here's a quick reference to running join operations in Rails. See Guide to Web Development for a full course on web development. You can use Active Record joins to query one model based on data from a related table. For example you can return specific categories based on each category's products. Technical note: joins in Rails runs an SQL 'inner join' operation and returns the records from the model you're operating on. A simple joins statement lets you return records that have an associated record. 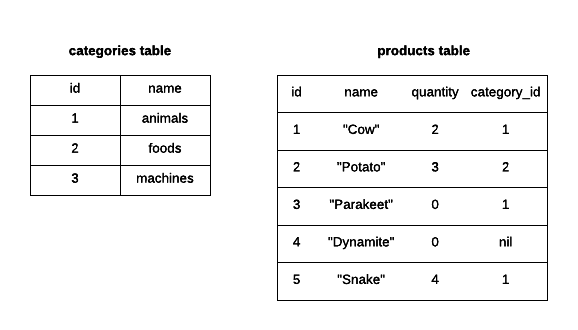 SQL: SELECT "categories". * FROM "categories" INNER JOIN "products" ON "products". "category_id" = "categories". "id"
Active record just returns the records for the model you called (categories). This query returns all categories that have products. It will return a category for every match it finds, which means there can be many duplicates. This will return all categories that have products, without duplicating any categories. SELECT "products". 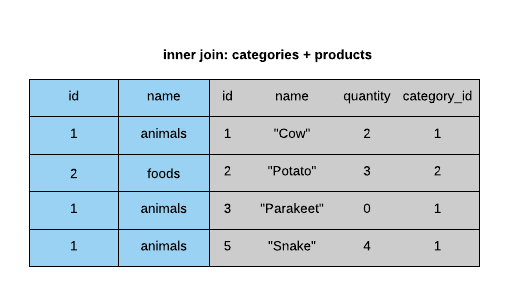 * FROM "products" INNER JOIN "categories" ON "categories". "id" = "products". "category_id"
This will return all products that have a category. .joins works for all the Rails relationship types. SELECT DISTINCT "products". 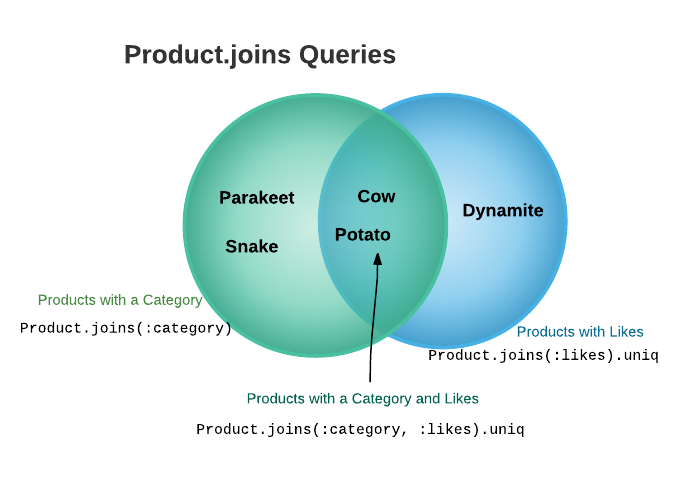 * FROM "products" INNER JOIN "categories" ON "categories". "id" = "products". "category_id" INNER JOIN "likes" ON "likes". "product_id" = "products". "id"
This returns all categories that have products that were liked. SELECT DISTINCT "categories". * FROM "categories" INNER JOIN "products" ON "products". 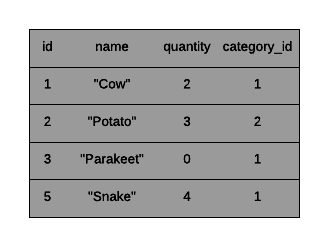 "category_id" = "categories". "id" INNER JOIN "likes" ON "likes". "product_id" = "products". "id"
You could also run a query based on multiple associations. For example, let's say Product has_many reviews and likes. This query would return all categories with products that have reviews and likes. Before looking at more advanced joins queries, let's look at querying a single model. This will return all products with a quantity greater than 3. This returns all categories that have products with a quantity greater than 3.